Dylan’s work has been characterized by the poetics of place and displacement and a refutation of a fixed identity. "An artist has got to be careful never really to arrive at a place where he thinks he's at somewhere. You always have to realize that you're constantly in a state of becoming." This fine bit of editing by Scorsese highlights a constant aspect of Dylan's varied career and repertoire, namely a tug-of-war, or dialectic, between place and displacement, also played out as a negotiation between movement and stasis, travel and home, present and past. Dylan presents himself -- convincingly, for the most part -- as an artist more interested in becoming than being and he continually stresses, in his life and art, a desire to move on to another place, to be somewhere where all those people looking for him (the “real” him) will not think to look. But this doesn't ever do away with the constant haunting presence of home, stasis, and the past in his work. He is an artist who, no matter what he may say, really does look back. Dylan's work has always been characterized by a poetics of place and displacement. The poetics of place establishes itself through recourse to repeated mentions of real and imagined places, which seem to fix many of Dylan's texts in recognizable locations and which are therefore crucial to the ability of his audience to identify with the texts. These locations -- whether actual or metaphorical -- are fixed moments that the memory can focus on even as it struggles to recall other features. The poetics of displacement, meanwhile, seeks to challenge and destabilize any sense of permanence even as it simultaneously relies on a set of temporary memory sites. Dylan's displacement techniques and refusal of a fixed identity constantly unpick the knowable, but cannot escape the desire for stabilizing moments. This typically Dylan-esque logic exposes the bewilderment at the heart of the dialectic of place and displacement. Home, it seems, is as much where you're going as where you've been; you'll know it when you see it, but your recognition, by definition, will consist of something you already knew. These qualities of remembered bewilderment and bewildered memory run like threads through Dylan's career, arguably finding their most telling manifestation on Blood on the Tracks, an album full of longings, imaginings, and memories, peopled by an ever-shifting but ever-interlocking (“tangled”) cast of characters. In Blood on the Tracks we meet our unreliable narrator “heading out for the East Coast” in the opening song; over the course of seven verses, we drift through New Orleans and Delacroix, settling briefly in a basement on Montague Street, only to end up where we started, “Still on the road / Headin' for another joint." “The only thing I knew how to do," sings Dylan through his alias, “Was to keep on keepin' on like a bird that flew." Speaking in 1978, Dylan proffered the opinion that Blood on the Tracks differed from his earlier work in that “there's a code in the lyrics and also there's no sense of time. There's no respect for it: you've got yesterday, today, and tomorrow all in the same room, and there's very little that you can't imagine not happening.” To shift the temporal and spatial axes of this observation, we could also say that here, there, and everywhere are taking place at the same time. "Tangled up in Blue" sets the tone by roaming across time and place, suggesting that any attempt to sort the tangle of memories the singer finds himself afflicted by can only ever be provisional and temporary. The lack of fixity is emphasized by the changing personal pronouns of the verses and the tendency for Dylan to rewrite the lyrics in subsequent performances. The personal pronouns shift again in the second track of the album, "Simple Twist of Fate", as the protagonist changes from “he” to “I”. The anguished cry of "I've never gotten used to it" in "If You See Her, Say Hello" stresses involuntary memory (the name he can't get used to hearing acts like Proust's petite madeleine), while I replay the past focuses on the voluntary memory work that inevitably follows. The unexpected flash of the past summons a desire to take control of one’s history in the hope of taming the power and danger of such flashbacks. "Shelter from the Storm" imagines "a place where it's always safe and warm", an appeal to the homely that contrasts with the displacement enacted elsewhere. "Buckets of Rain", the cozy blues that closes the album, suggests the singer may have found his shelter. The dialectic of place and displacement is also to be found in Dylan's famous "wild mercury sound", that magic sonority he sensed while at his 1960s peak and which he rediscovered magnificently on Blood on the Tracks. It's entirely possible for both performer and audience to lose their place in this music. 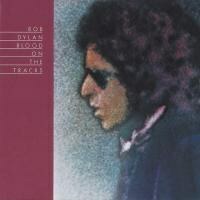 From the performer's side, this can be witnessed by the number of live recordings in which Dylan loses his way in the lyrics; he also, it should be pointed out, battles his way out of lyrical dilemmas triumphantly and creatively, as can be heard on the alternate recordings of those Blood on the Tracks songs that were released on the first official Bootleg Series. This disorientation should be seen as part of the "code" Dylan speaks of, an invitation to engage in a ritualistic setting-aside of everyday time, space, and logic. This is something Paul Williams drew attention to in his discussion of the album in the second volume of Bob Dylan: Performing Artist. Williams also highlighted the way that the rhythmic thrust of the songs on Blood on the Tracks drives the listener on. Something compels us to follow Dylan into his labyrinth of words and sounds, even at the risk of losing our way. Theme and form support each other as Dylan delivers his sweeping narratives over washes of organ, driving guitar, and insistent drumming. There is pleasure in the way Dylan displaces us, handing us the magical constructs of his peculiarly stressed verses to ponder over as he moves on and away from us, leaving blood on the tracks. Nowhere is this more extravagantly achieved than on Idiot Wind, with its spellbinding structure. As Williams wrote of the song, "Dylan more than ever shows himself master of juxtapositions, connections, quick dissolves and timeless freeze frames". These juxtapositions provide a sense of place as much as displacement. These are popular songs, after all, and popular songs love to come home. Dylan's refrains bring it all back home and provide a "round trip" that is part of the geographical quality to his songs. Blues structures suggest their resolutions right from the start, while folk ballads circle infinitely around refrains. Dylan's phrasing also brings a sense of stability even as he is displacing linguistic commonplaces; witness the role of "idiot" in "Idiot Wind", or the refrains of "Tangled Up in Blue" and "Shelter from the Storm". Home is the pull here and, for all the moving on that needs to be done, there is always a temptation to turn around and look behind. Displacement derives its power from the pull of place, after all. How much of Bob Dylan should we read into these songs? Dylan's response to his fame and to the expectations that come with it is as prone to displacement as his songwriting. Again, refusal seems to be the defining strategy: distancing himself from the folk music scene he helped to define, distancing himself from the role of "visionary" and from any particular political stance, distancing himself from his own work and legacy through a constant reinterpretation of his songs. Like his character Alias in Sam Peckinpah’s Pat Garrett & Billy the Kid, Bob Dylan is always somewhere and someone else. What is said of the relationship explored in "Tangled Up in Blue" might also be said of the relationship between the various Dylans we have been offered down the years: "We always did feel the same / We just saw it from a different point of view."